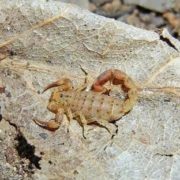 Scorpions are small animals with a curved tail that can deliver a poisonous sting. 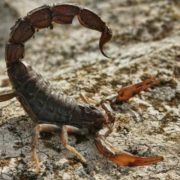 About 25 of 1,400 species of scorpion can kill people with their poison. 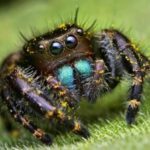 They are members of arachnids and are relatives of spiders. 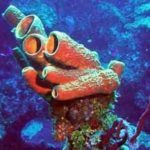 These animals are found throughout the world except in Antarctica. 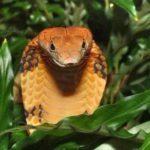 Many of them live in the desert, but they also can be found in grasslands, in caves, and in forests. 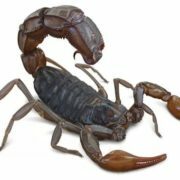 Scorpions have four pairs of legs, claws, and a sharp, hollow stinger on the tip of the tail. 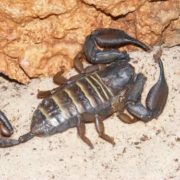 Scorpions eat at night and hide for much of the day. 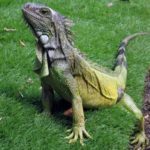 They feed on insects and spiders, but larger species may eat lizards, snakes, mice, and other scorpions. 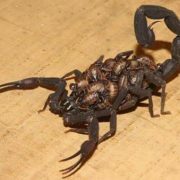 The scorpion, of course, does not hunt people and sting only if the person disturbs it. 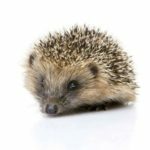 Hedgehogs, mongooses and some species of lizards are insensitive to their poison. 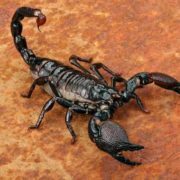 Scorpions are also eaten by snakes, birds, bats, large spiders and phalanges. 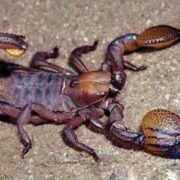 The longest scorpion is the rock scorpion of South Africa. 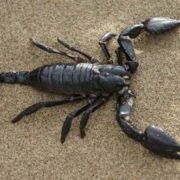 Hundreds of millions of years ago, scorpions came out of the water and adapted to life on land. Since then, their appearance has not changed much. 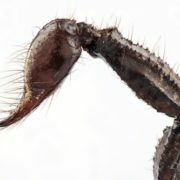 Many species of scorpions do not need water – there is enough moisture in the air. 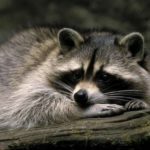 Moreover, if necessary, these animals are able to starve for up to a year and a half and even longer! 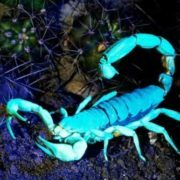 It is interesting that scorpions survive huge doses of radiation without harm. 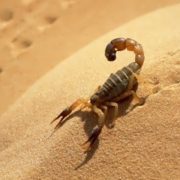 After the tests of the atomic bomb in the Sahara desert only scorpions survived. 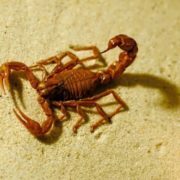 The famous scholar of antiquity, Pliny the Elder, wrote in his Natural History book: “A scorpion is a terrible creature, poisonous like a snake, with the difference that its bites entail even more painful. 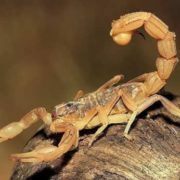 The scorpion bite is always fatal for girls and almost always for women, and for men only in the morning”. 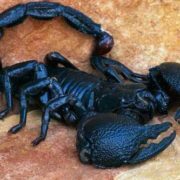 Mention of a scorpion as a gloomy and disgusting creature is found in ancient Egyptian papyri, in the Talmud and in the Book of the Dead. 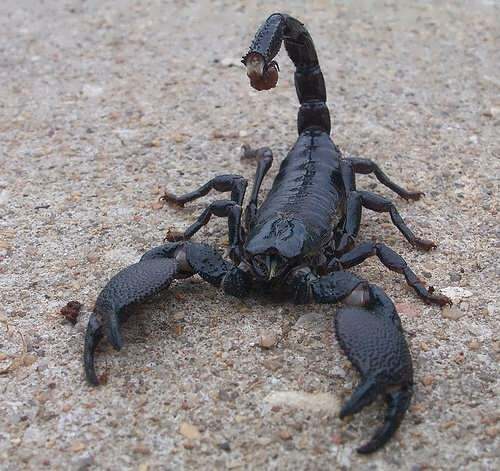 According to the Bible, scorpions are the root inhabitants of hell. 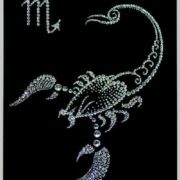 The ancient Egyptians believed that the founder of the power of the pharaohs was the legendary Tsar Scorpio. 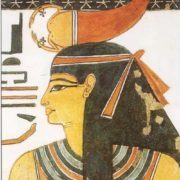 The Egyptian goddess Serqet, the patroness of the dead and the defender of the living, was portrayed with a scorpion on her head. 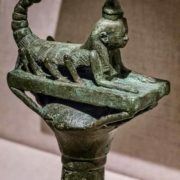 In many tribes of Africa it was believed that the animal was able to create an antidote for its own poison, and therefore the scorpion was a double symbol: the killer and the healer. 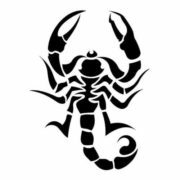 The ancient Greeks literally put the scorpion on the sky, calling one of the constellations in its honor. According to the myth, the mighty hunter Orion boasted that he could kill any animal and dared to challenge goddess of hunting Artemis. 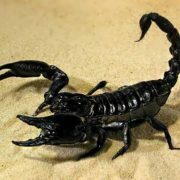 She became angry and sent a poisonous scorpion to Orion who died in terrible agony. The murderer, however, was sent to the sky as a constellation. Orion also appeared in the sky as a constellation. 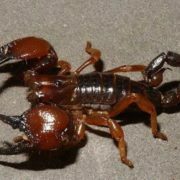 But Orion had never met a scorpion again. The constellations of Orion and Scorpio do not appear in the sky at the same time. When Scorpio appears, Orion leaves the horizon. 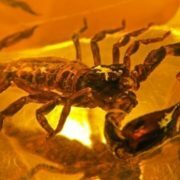 The ancient alchemists believed that with the help of a scorpion, one can find a philosophical stone.